If you use Google Chrome as a web browser you have probably noticed that the Adobe Flash plugin is contained within the app by default, even if you have uninstalled Flash on your Mac. This is good because the plugin is sandboxed, but some users may wish to disable the Flash Player plugin within Chrome anyway. 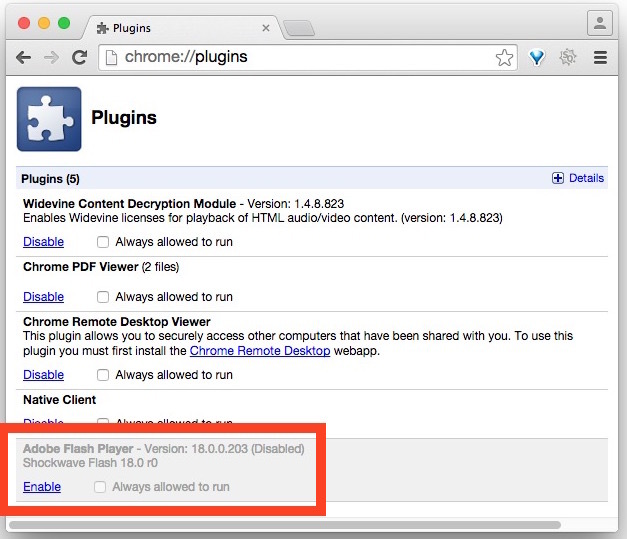 Managing the Adobe Flash Player plugin is the same on any platform running Chrome, whether it’s Mac OS X, Windows, or Linux, the example here is using Chrome on a Mac in OS X.
Disabling Adobe Flash Player plugin in Chrome is easy, here is how you do it in modern and older versions of the Chrome browser. Flash will now be disabled everywhere in Chrome. The change is immediate and will carry across to all active browser tabs and windows, so if Flash is running in one of them it will cease. You don’t need to restart Chrome, Flash will be disabled from all future browsing sessions. 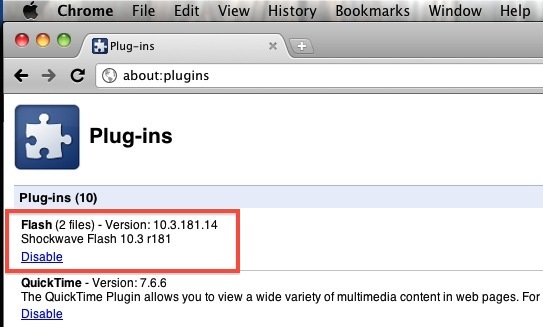 Re-enabling the Flash plugin is obviously just a matter of going back to the about:plugins menu and choosing so. Keep in mind the exact phrasing can vary and appearance can look slightly different depending on the version of Chrome you’re using and under what OS, as well as the version of the Adobe Flash plugin that is installed. Regardless, it can be disabled in all versions of Chrome this way. By the way, you should keep Chrome updated to the latest version for best results… this includes the latest abilities to toggle flash off and on, and updating Chrome will also update the Flash plugin too. A few alternatives to completely disabling or uninstalling Flash are to use a Flash Block plugin like ClickToFlash, the Click To Play plugin option in Chrome, or to use an ad blocker plugin since most of the annoying Flash comes in the form of advertising. My personal preference is to use Click To Play within the Chrome browser itself, this allows you to use Flash when it’s necessary for some websites, but it won’t run automatically without user input. This handy tip came in via Twitter, you should follow us on twitter @osxdaily for many great tricks, important news, and to keep up to date with the latest from OSXDaily. Better yet, you can enable click-to-play and only enable flash when required. Yup this is the way to go. turning off flash is just… sick, dudes. sick. SICK. don’t follow Steve Jobs way. he’s got his reasons (moneeeeey, they take our jobs & flash take our apps, etc.). i know – performance is terrible (compare to windows version), but i rather expect from Apple to help build good player, than ban it. Apple haven’t banned it on OSX. And they have a good argument for not putting it onto iOS. Personally, I do not miss flash on my iPhone. And on my Mac all it seems to do is run annoying ads. Now I think flash should not be used for video. Rather better OPEN standards (things like HTML5) should be used for such common multimedia. Flash does have its place and uses however. I’m pretty sure that it’s down to *Adobe* to bring better performance on the Mac – not Apple. If Adobe can get flash to run well on windows then why not on a BSD based OS? I wonder if there is a way to get to this panel without typing about:plugins – I mean from GUI interface. As I was testing my flash site and so I was looking for how to disable it, thanks for showing the option. Flash will be as popular as it was, I will never let it die.